When you have a passion for viewing total solar eclipses, the quest for the perfect vantage point never ends. You could be on a remote mountain slope, in the middle of a desert, crossing the Arctic tundra or sailing among Pacific islands – and TravelQuest has journeyed to all of these places and more. We have the answer. Join us as we venture high above the clouds aboard a chartered passenger jet on TravelQuest’s third Flight to Totality. 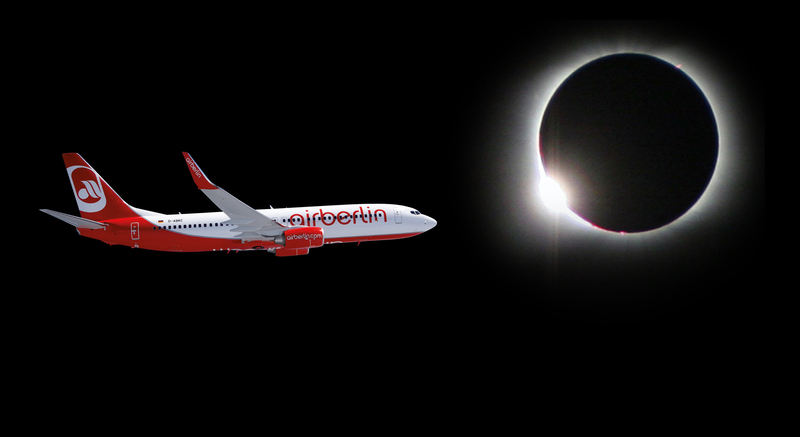 Reuniting with our friends at AirEvents in Germany, we’re offering a unique opportunity to experience the March 20, 2015, eclipse from a whole new perspective. 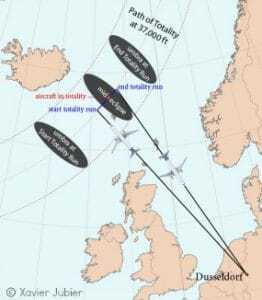 Departing from Düsseldorf International Airport (DUS) aboard our comfortable Air Berlin Boeing 737, your six-hour flight will make a loop to the northwest, intercepting the Moon’s shadow over the Arctic Ocean. We expect to experience a longer period of totality – approximately 3 minutes and 45 seconds – than would be possible anywhere on the ground. For this special flight we’ve enlisted the expertise of Dr. Glenn Schneider, Astronomer and EXCEDE Project Principal Investigator at the University of Arizona’s Steward Observatory. Glenn has coordinated flight logistics for many eclipse intercept flights, and his reputation among airborne eclipse chasers is second to none. Indeed, his technical guidance was invaluable to the planning and execution of our highly successful August 2008 eclipse flight near the North Pole. To ensure optimum viewing opportunities, we’re strictly limiting the number of passengers on our Boeing 737. So before and after the eclipse you can count on plenty of room to move around the cabin and take in the views from both sides of the aircraft – while enjoying full food and beverage service. To complete this remarkable trip, we’ve even arranged a convenient hospitality package that includes two nights hotel accommodation in Düsseldorf and a post-flight celebration feast at a traditional Rhenish brewery (yet to be confirmed). For more flight details, visit Dr. Schneider’s website. View the March 20, 2015, total solar eclipse over the Norwegian Sea. Flying above the clouds, you’re almost guaranteed to see totality. At our mid-eclipse location, the Sun will be approximately 20° high, perfectly situated for observing from an aircraft. Limited passenger capacity ensures a relaxed, comfortable flight. Enjoy attentive, international-class food and beverage service. Add our optional two-night Düsseldorf hotel package: March 19–21.